> Knowledge base> Article: Top and bottom drives are reversed/swapped. How do I reselect the drives in PTPublisher? If you change to a new computer or receive your Publisher back from repair with new drives, it may be necessary to reassign top and bottom drives. Follow the steps below to reassign the drives. 3. Click Set Drives in Publisher. 4. Click Reset Drive Locations. 5. The Publisher will reset. Close the utility. 6. Open the utility again. Click the Set Drives in Publisher button again. 7. Now choose the top and bottom drives. 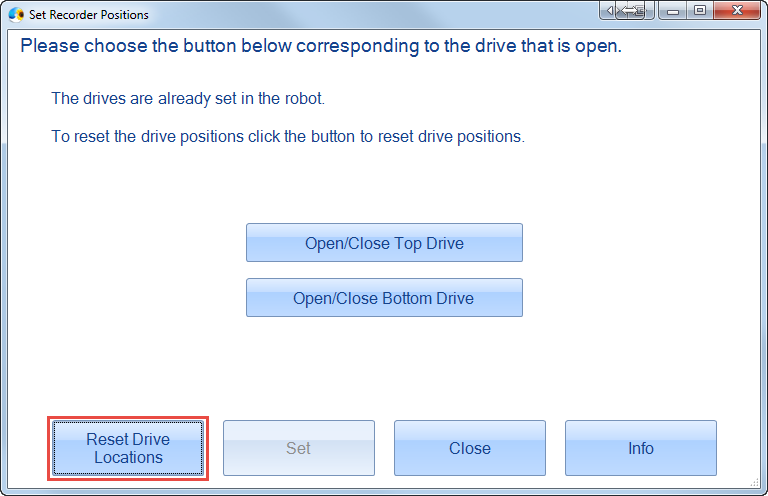 Use the Open/Close buttons to determine which drive is the top and which drive is the bottom. Watch the drive tray in the Publisher while you do this. 8. Click the drop down to set the drive to either Bottom, Top or Not in Publisher. You should have one top and one bottom drive. 9. Click Set. The window will close. Now close the utility and open PTPublisher. 1. Once PTPublisher is open, click on the PTPublisher menu. Choose Preferences. 2. Click the Properties tab. 3. Click on Reset Drive Positions. 5. Open it again. 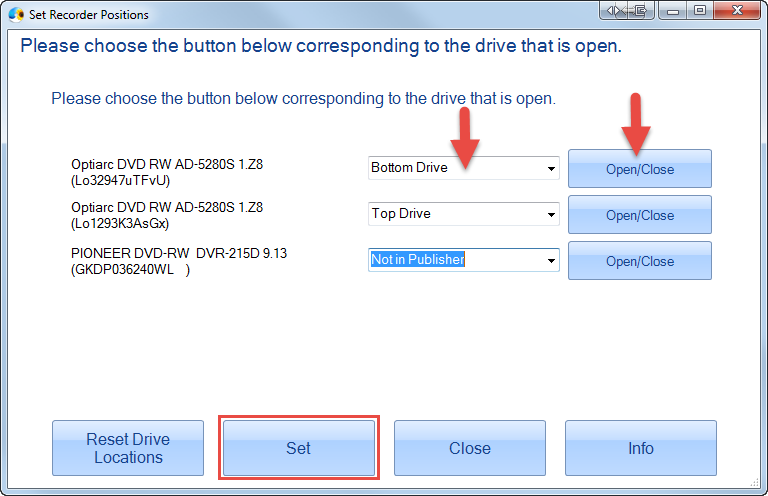 You will be prompted to choose which drives are open.